Summer is in full swing which means that it's hot outside all the time across most of the country. Where I live it's a high of 96 degrees today. I think I will be staying inside and eating sorbet to cool down. I would eat ice cream but I may or may not have eaten all of my homemade ice cream yesterday. 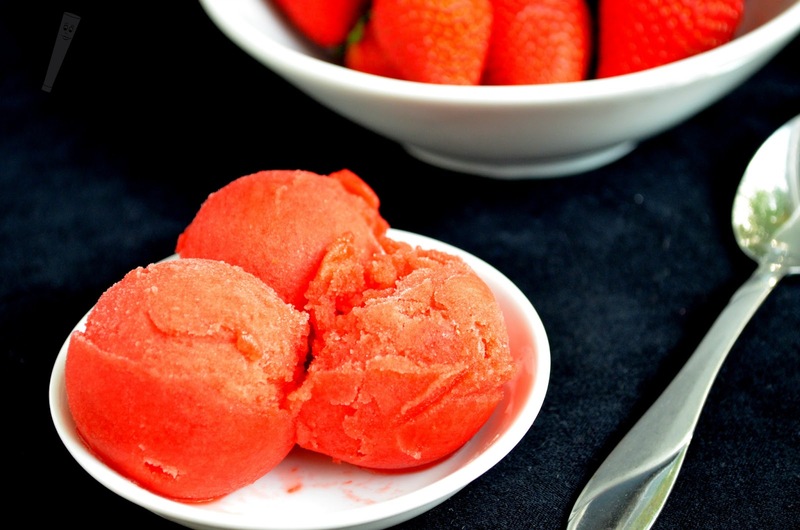 Sorbet is such a cool and refreshing treat and making it yourself ensures that you can put whatever ingredients that you want to into it making it your own creation. My birthday was last week and one of the presents I recieved was an ice cream maker like this one. In the teal color, it's absolutely beautiful. I was so excited that the next day I made two types of treats, a sorbet (this one of course) and some cheesecake ice cream. I think we will have homemade sorbet and ice cream probably once a week from here on out. Maybe using some fresh peaches or blueberries? or maybe something wild like carrot cake ice cream. I would love to visit one of the "pick your own" farms for some fresh fruit. Maybe apple cobbler ice cream?? I definitely write these down on a piece of paper of ideas for desserts while I'm writing this and thinking up these crazy ideas :). 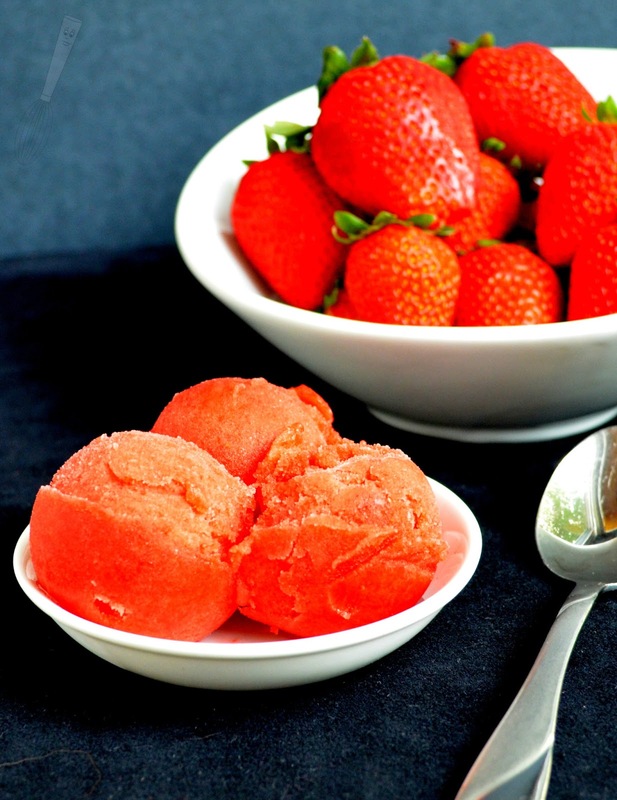 The balsamic may sound a little scary to add to the sorbet but it really just defines the strawberry flavor a little better. It's similar to adding coffee to chocolate desserts because it brings out the chocolate flavor more. Since you're making it then you could always add more or less to meet your tastes. I wouldn't leae it out though because I believe it really adds to it and nobody would know it was in there unless you told them. You could also make this without an ice cream maker by stirring it occasionally in a freezer safe container until it's frozen, then pureeing it in a blender (with a bit of juice or water to help smooth it). As always, please ask if you have any questions or thoughts! 1. In a medium bowl stir the strawberries with 2 tablespoons of sugar and the lemon juice, then let sit for 30 minutes so that the berries will release their juices. 2. In a food processor, blend the strawberries (with juice) until they are smooth, then press through a fine sieve. Discard the seeds. 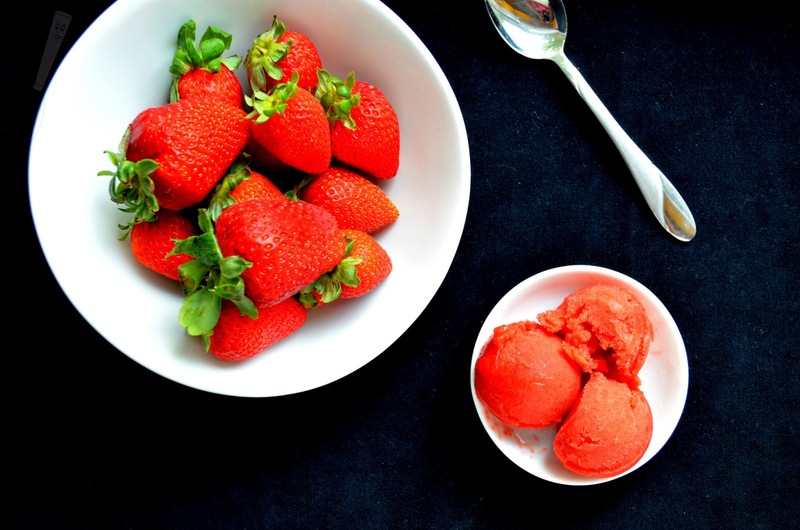 Place the strawberry puree back into the medium bowl and stir in the ¼ cup of sugar, balsamic vinegar, and salt until blended. 3. Chill the mixture 30-45 minutes or until cold, then follow the manufacturer’s directions using an ice cream maker. Store in a 2 cup container.